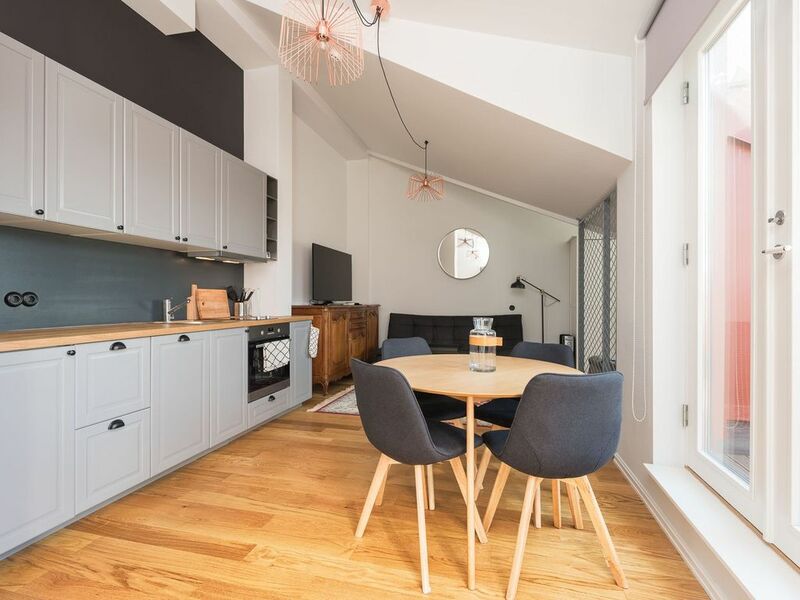 This modern apartment is situated in the heart of Tallinn and a short walk away from the Old Town, shops, ferry terminals and the business district. The best city restaurants, trendiest bars and night clubs, theatres and stores are less than 5 minutes away. The apartment features a fully equipped kitchen, high speed free wi-fi and a balcony that fills the apartment with natural light and a stunning view of the Old Town. A lovely apartment which has everything you need for a comfortable stay! The apartment is located in the 5th floor, and it has an elevator. The key will be given by your host or it can be collected in the front desk. If you require any assistance during you stay, just ask us! Passenger Terminal A is 700 m from Lighthouse Apartments, while Passenger Terminal B is 700 m away. The nearest airport is Lennart Meri Tallinn Airport, 4 km from the property. Bus number 2A from Lennart Meri Tallinn Airport (TLL) to Viru Shopping Centre. Bus departs for every 7 minutes. Our modern apartments are inside a beautifully restored 19th century cultural monument, built in 1888, in the heart of Tallinn, just meters from the Old Town, harbour and business district. Everything is just a couple of min walk away - restaurants, pubs, clubs, shopping malls. Our cozy apartments are ideal for couples, families and tourists, who love home comfort and great design. Our apartments have comfortable beds and cozy sofas. They are modern and located in the top floor of the building. They have wooden floors, large windows and some of them have balconies facing the Tallinn Old Town. Kitchen is fully equipped and it also has dishwasher and an oven. The apartments offer free Wi-fi and TV. They have everything you need to make your stay comfortable and you will absolutely enjoy the amazing view of old town or to the Terminal harbour. Thanks to the proximity of the harbour and Old Town, many tourists travel along Mere boulevard and it is a preferred region for locals to visit restaurants, shop around or dive into the entertainment life of the weekend. Paid parking is available near to hotel. Reservation might be needed. All good, I like the place. Good that there is 24h reception. This flat was perfect: on the edge of Old Town that can be seen from the balcony at sunrise and lit at night. Secure building, helpful 24/7 staff at the front desk. Booking with Sandra was convenient and professional. Highly recommended. Thank you so much for your good words and review, John! Great location right next to the old town and Rottermann area. Very nice terrace with a spectacular view to the old town. Passenger Terminal A is 700 m from Lighthouse Apartments, while Passenger Terminal B is 700 m away. The nearest airport is Lennart Meri Tallinn Airport, 4 km from the property. Tallinn City-Centre is a great choice for travellers interested in restaurants, food and history. This is our guests' favourite part of Tallinn, according to independent reviews. This property also has one of the best-rated locations in Tallinn! Guests are happier about it compared to other properties in the area. Couples particularly like the location — they rated it 10 for a two-person trip. This property is also rated for the best value in Tallinn! Guests are getting more for their money when compared to other properties in this city. We speak your language! The full amount will be charged before the arrival otherwise the booking won't be guaranteed and the deposit will be lost. The property reserves the right to pre-authorise credit cards prior to arrival. Taxes included. Other charges: If cancelled before 14 days of the date of arrival, no fee will be charged. If cancelled later, 50 percent of the total price of the reservation will be charged. No deposit will be charged. Private parking is possible on site (reservation is needed) and costs EUR 15 per day.. 100% booking amount will be charged in case of no-show.